This article originally appeared in Issue #75, Summer 2019. CLICK HERE to purchase our most recent issue. 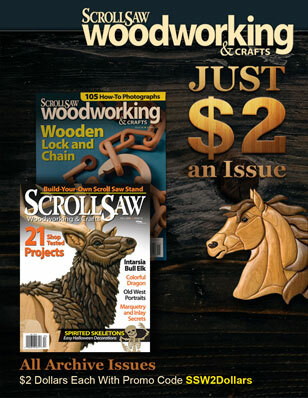 Pégas’ new Scroll Band Saw might change how you look at projects—it certainly has for us! The first band saw to accommodate a continuous scroll saw-sized blade, it combines the power of a band saw with the accuracy and tight turning radius of a scroll saw. 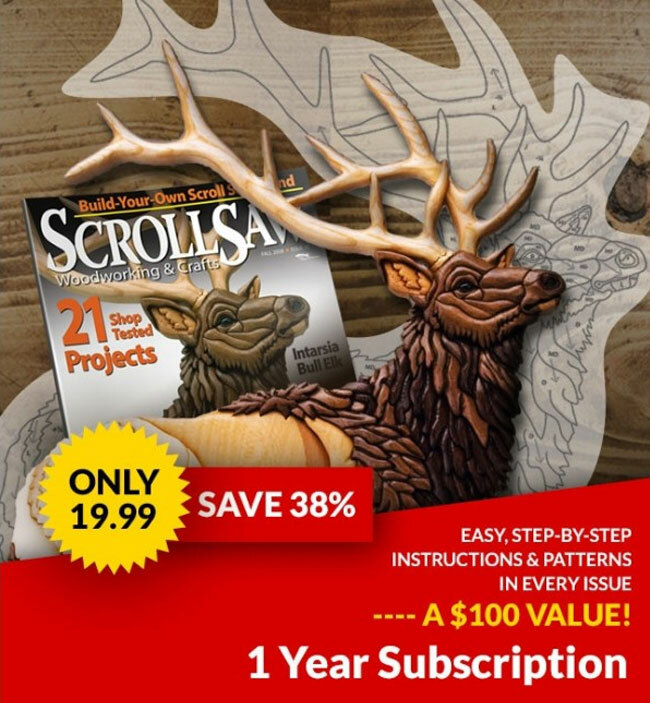 With this amazing new tool, you can cut thicker wood for intarsia to achieve greater depth and dimension, stack-cut freestanding puzzles, upsize compound-cut projects (like chess pieces), or make large 3-D puzzles—fast. The only thing it can’t do is cut inside frets—if that’s your thing, this baby isn’t for you. Everyone else, however, will love it. The heart of the saw is two precision-grooved bearings—one above the saw table and one below it—which support the blade as you cut. Without these bearings, the blades would snap whenever you made a tight turn. 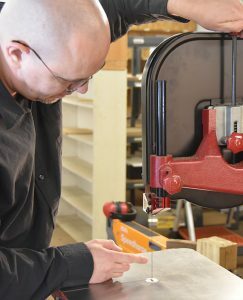 But with them positioned properly, it cuts a 1/4″ (6mm)-diameter circle in a piece of 4″ (10.2cm)-thick basswood as easily as a scroll saw does on wood of 1/4 the thickness. 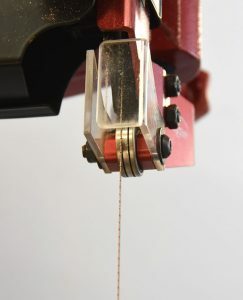 Blade tension plays a big part in making square and accurate cuts. And as with a scroll saw, the proper tension is subjective: too little and the blade wanders and gives you curved cuts; too much, and the blade is more likely to break. Pégas suggests treating the band saw blades like you would scroll saw blades, as follows: Move the blade guide to the uppermost position. Then press on the side of blade. As a baseline, Pegas recommends tensioning the blade so it flexes 1/8″ (3mm) to 5/32″ (4mm). We tensioned the saw like this and it cut well on the dolphin puzzle we used as a test. The saw is large enough to cut 6 1/4″ (15.9cm)-thick wood. The table is 16″ (40.6cm) square; the left side tilts to 15° and the right side tilts down to 45°. It’s been precision-engineered to use blades as small as a #5 scroll saw blade at 0.0142″ (.36mm) thick and 0.0402″ (1.02mm) wide. 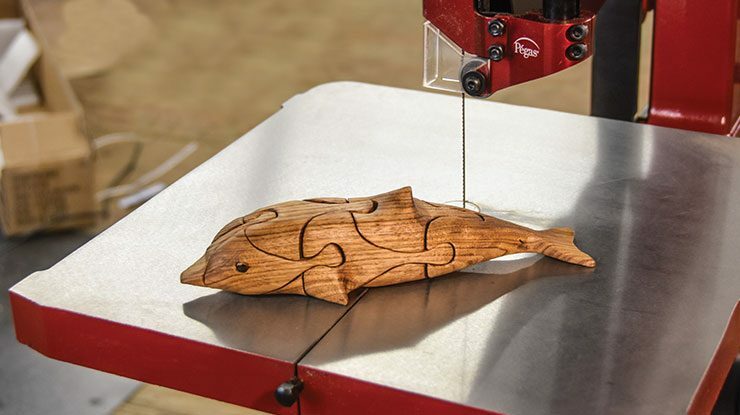 To test the unit, we increased the size of the dolphin puzzle by Alexander Klimov and cut it from a 3″ (7.6cm)-thick piece of butternut (larger than anything you can cut with a scroll saw) using the #12 blade that comes installed on the saw. We were shocked at how fast the saw cut—and how easy it was to control. When cutting with the grain, we noticed some smoke coming out of the cut, which wasn’t a surprise. 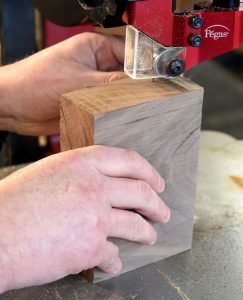 The small teeth of most scroll saw blades clog easily when cutting with the grain. But when we looked at the cut dolphin, we only saw a few areas where the wood was actually scorched, and those were where we made tight turns. We attribute that more to the new users than to the saw itself. We did struggle a bit to make especially tight turns where a curve turned back upon itself, as with the areas around the fins. With practice, however, or a smaller blade, those curves would be easier. We cut the entire dolphin without breaking a blade, which was surprising given our inexperience with this unit. It seems that as long as you keep the blades within the grooves in the bearings, you’ll be fine. This means you can’t make a 90° pivot turn by pulling back slightly on the blade; it also means that if you inadvertently pull the blade out of the bearing slot, you have to reposition it before continuing. That also speaks highly of the manufacturing technology of the blade. Think about it—you need to weld the two ends of tiny blade together to create one continuous loop. Such precision pays off: after cutting all of the pieces, I could assemble the puzzle from either side with no problem. Our one small quibble was the clear acrylic plastic guard at the top of the blade. 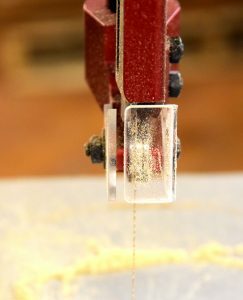 It collects sawdust right where you’re trying to see, so you’ll want to keep a can of compressed air handy. We also suggest adding an aftermarket light that uses a magnet to attach to the unit. And keep in mind that only Pégas makes blades for this saw, so you won’t be able to run down to your local hardware store to pick up a new one. Simply put, the Pégas Scroll Band Saw is a game changer. 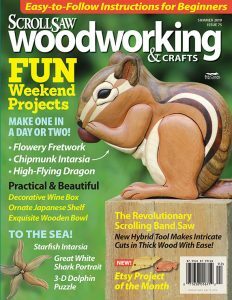 Fretwork (and resawing) aside, it expands the possibilities for anyone cutting hardwood puzzles, intarsia, or compound pieces. It cuts thick hardwood accurately and quickly, and the cut is perfectly square from front to back, allowing for more accurate joints. Yes, it’s expensive—but it’s also a technological breakthrough, and worth every penny.